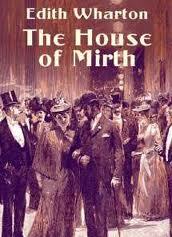 Irony in The House of Mirth essays examine the life of Lily Bart and how Edith Wharton weaves irony throughout the novel. Research papers on literary elements such as irony are common for the writers at Paper Masters. Edith Wharton's works are popular in American Literature courses. Wharton is an excellent example of an American writer that uses irony frequently in her stories, especially in The House of Mirth. If Lily had used the letters to blackmail Bertha Dorset, she would have ended up back in the same place she was before--a wealthy socialite, but dead and empty inside. Lily and Selden would most likely have married. Her reluctance and subsequent refusal to use the letters, although resulting in a tragedy, gives some substance to her character. As The House of Mirth nears its end, we are rooting for Lily, hoping that she will do what it takes to ensure her survival. However, we are also witnessing a changed woman. Gone are the meaningless outings of nothing more than a socialite hoping beyond hope to use her charm to secure a very wealthy husband. Lily has redeemed herself as a human being. Through her tragic ending, she has gained a sense of morality. And although her story is indeed a tragic one, we are able to see Lily Bart as more of a complete and human person, whereas before she was more of an attractive yet empty shell. Adding to the ironic ending is the belief that Lily and Selden would have joined in matrimony or another kind of union one day. As The House of Mirth concludes, it seems that Lily’s only chance in life, at least in regaining her old life, would have been to blackmail Bertha with the letters. Situational Irony - Essays on situational irony discuss the use of verbal irony used in literature. Verbal Irony - Essays on verbal irony discuss the rhetorical device intentionally produced through speech to convey a form of irony. Dramatic Irony - Essays on dramatic irony look into the rhetorical device used in literature to convey to the audience of a particular piece of drama is aware of while the characters are not. Analyzing Age of Innocence - An Age of Innocence analysis must pay heed to the novel’s predominant theme of the personal struggle between individuality and conforming to social expectations. Foreshadowing and Irony in Flannery O'Connor's Works - An essay on foreshadowing and irony in Flannery O'Connor's works essays look at her works like A Good Man Is Hard to Find. Wharton's Age of Innocence - Edith Wharton's The Age of Innocence demonstrates the changing morals and assumptions about New York society in the 1870s. The Age of Innocence - The Age of Innocence is a novel written by Edith Wharton that was published in 1920. Paper Masters writes custom research papers on Irony in The House of Mirth and examine the life of Lily Bart and how Edith Wharton weaves irony throughout the novel.